We had our first operation in 2019. For training, perfect weather. Not too cold, no rain and light winds. Ivan was the instructor of the day, David was the Field Manager making sure we had a smooth running operation. It was not just us who were out flying, the airport was busy with fixed wing, helicopter and even Lear jet traffic. At one point there was a helicopter, an ultra-lite, a hombuild, a glider and me on final. But it all worked out, situational awareness kept us save. I don't think a traffic tower could have handled the traffic any better. Following is an account by Thomas Van de Velde about his flight from Arlington on July 29 that earned him 489 OLC points and 3rd place in the WBC 2018. It is a nice reminder of the XC potential of soaring out of Arlington even when haze and smoke seem to snuff out all expectation of good lift. So, congratulations to Thomas for a great flight and thanks for sharing the experience! September 25 marked the end of the 2018 OLC year and thus also the end of the Willy Burhen Cup (WBC) 2018. This is the 14th annual competition for the best XC flight of any soaring pilot in Western Washington in memory of Willy Burhen who was one of the enthusiastic supporters of exploring the XC potential of the Cascades. The Twisp OLC campis now an established event for the Washington State soaring scene. And this year's evnt during the last week of June was another success story despite not having the best soaring conditions. June 29 - the last day of the camp - was the best day and the three best flights on that day were also the best for the whole week. Here is a comprehensive report about the recent SSA convention - thanks Heinz! Got the fly the Perlan simulator two times. Got a nice glider model to fly and show off at meetings. Great presentations, some were better than others. Brad Hill How do I make the Tetra into a gun paltaform? Dan Housler Hi guys, I haven't seen you for a while. Fred Hermanspann Get the Chinook into the air again. Movses Babayan Which glider do I want to fly today? With the end of the soaring season for this year it is time again to review what happened in the world of XC soaring in the state of Washington (WS). While the calendar year is not over yet, the OLC year 2018 started already on September 25. This cutoff for the OLC 2017 may generally be enough to cover the thermalling season but wave flying is attracting some renewed interest lately and we have already some entries for the OLC 2018. September 24 marked the end of the OLC 2017 year and thus the end of this year’s WBC competition. This is the annual competition to prove that XC soaring is possible and actually quite competitive on the “wet” side of the mountains. Another noteworthy flight by Evergreen’s chief explorer Ron Clark. This took place on 7/29/2017, when Arlington had typical stable summer conditions, while there were nice looking clouds visible further east some 20 miles away. Ron realized the potential of these conditions in the high country and took a long and high tow, resulting in another of his pioneering flights. It has become now a tradition - the XC camp in the middle of the summer. From June 26 to July 1, 2017, it was the time to explore the spectacular scenery of the North Cascades in the best soaring conditions during the longest days of the year. Some 15 pilots from the Sawtooth Soaring Association, ES, SGC and PSSA took up the challenge of exploring the mountains. After a long wet sping we had (finally) a stretch of good XC weather over the Memorial Day weekend and Ron Clark was ready for it. 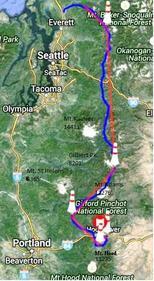 Following is his account of the first XC soaring flight from Arlington to Walla Walla,which is also the leading entry so far for the Willy Burhen Cup (459 OLC points). The next day Ron flew from Walla Walla to Ephrata (another first), next day he made a "local" flight from Ephrata (441 points) and on the fourth day he flew home to Arlington with some major diversions in the mountains for 511 points! In the world of General Aviation it has become a tradition to come to the Zeppelin city of Friedrichshafen every year in April to be dazzled by the latest offerings from the various manufacturers. Gold Badge and Diamonds in Western Washington? Now that Thomas Van de Velde has shown convincingly (i. e.
The New Year 2017 celebrations are barely over but for the OLC year 2017 (which began in September) the most spectacular soaring may be already over. This is not to ignore the upcoming World Championships in Benalla or the upcoming soaring season in the northern hemisphere but is based on some outstanding long distance soaring in the southern hemisphere that captures the imagination and the admiration of soaring and non-soaring pilots alike. Several years ago the IGC – the international body governing the sport of soaring – decided that the World Class (based on the PW-5) was not viable because it just did not appeal to the soaring community. Thus ended the first, and so far only, attempt by the IGC to revive soaring competition with a “cheap” one design class that would also provide a reasonable tool for beginning XC pilots. Now that this soaring season in Washington is over, it is time again to take a look at what happened in the friendly skies over Washington. Evergreen Soaring (ES) pilots fly almost exclusively from three airfields - Arlington in western Washington, the ES home base, Twisp in the North Cascades, and Ephrata in Eastern Washington, the base for the Seattle Glider Council. As usual, the XC season for Evergreen Soaring started in March; however it did not really start in earnest this year until the beginning of May. Actually, it was a very rainy early season followed by an unusually warm and stable period. As a consequence all the better flights were made on a few selected days in the first half of May. The total number of XC flights in 2016 on the west side was far below the usual. Nonetheless quite a few pilots made their personal best west side flights indicating a general rise in XC capability. I just got back from a trip out of town and saw Ron's double cascade crossing last Thursday (http://www.onlinecontest.org/olc-2.0/gliding/flightinfo.html?dsId=5384322). In the pilot comments section of the OLC Ron remarked in his usual low key style, "Over and back. Who would have thought, this late in the year?" First of all, congratulations to Ron on a superb demonstration of his extraordinary pilot skills. There are few of us who have the abilities to pull something like this off. He continues to be an inspiration to those of us who are still trying to cut the apron strings. The 2016 Twisp OLC Camp is now in the history books, and it was a memorable experience for all involved. Ever since Bob Symons was able to soar a P-38 fighter engine off for about an hours at up to 32,000 ft over Bishop on a very stormy day in 1950, the Owens Valley wave has been a magnet for daring soaring pilots willing to brave the power of this manifestation of natural power. The Tuesday morning plan was for an exciting day of installing hardie-plank siding on the west wall of my garage. Motivation was low. The normal internet procrastination was in full swing… email, news, weather etc… Lately a new website has made its way into my morning routine, thanks to Noel Wade. This is the story of Tom and Kemp attempting to soar along the mountains from Williams (north of Sacramento) to Arlington and coming close to succeeding. It was a valiant effort that ended short of Mount Saint Helens when they had to start the engine and retreat to North Plains OR. They still flew an OLC distance of 491 miles at an average speed of about 75 mph for a total of 633 OLC points. While it was not quite successful it was an extra-ordinary flight and should serve as an inspiration to try for extra-ordinary tasks. Following is the story of another of Ron’s pioneering flights in the Cascades. This is so far the best soaring flight in 2016 in Region 8; it is also by far the best soaring flight from the west side of the Cascades. Btw, Tieton airfield at Rimrock Lake is the highest airfield in Washington State with close to 3000 ft elevation. Evergreen Soaring is blessed with a number of intrepid meteorologists that help to the general membership to get a better understanding of our local weather. Here is Ed's analysis of the strange weather this year that have made XC soaring such a challenge so far in 2016 (until May 3). Enjoy the article and chime in if you want to add to the discussion. "Cumulus" (plus trailer) that is nearing completion. Hats off for his perseverence and best wishes for the completion! And of course, will it get close to its hoped for 1-26 performance? Some impressions from the recent SSA convention in Greensville SC by Ed Walker. After years of having the “why don't you come out and enjoy the mountains” conversation with numerous glider pilots, some who have been soaring for years without venturing into the Cascades, and some who are relatively new to soaring, I think I have unraveled at least part of the puzzle. It's a four letter word that begins with the letter “F”. You know the one: Fear. Yes, that old bugaboo. While we have just started the calendar year 2016 and are still awaiting the first signs of usable lift (ridge, wave or thermals), it is hard to believe that the OLC year 2016 is already mostly over for the southern hemisphere (having started on September 20). The conditions in southern Africa (i. e.
Anybody contemplating XC soaring has to be prepared for the possibility “that the wind dies” and that a return to the home base becomes impossible (even for a powered glider which may not start up). Landing at another airfield is the preferred solution to this predicament but making an off-field landing may be the only option. So far this year four Evergreen pilots had to make off-field landings while venturing from Arlington, showing that this is not a lost art. All these landings were executed without any problems, demonstrating that off-field landings on the west side are not as chancy or risky as sometimes assumed. The very successful Twisp encampment is now memory and it is time to relate some of the experiences and to sort out the relevant achievements. First and foremost, it was successful because of Ron Clark thoroughly organizing this event, getting the Twisp community involved (including an article in the Methow Valley News), and getting a lot of local businesses to contribute prizes. And the whole event would not have been possible without Duane Barr's tireless towing efforts (and having to wait until every pilot was back for a possible retrieve before having a beer). Once again the Region 8 championships, taking place from June 14 to 20 in Ephrata, was a popular gathering for competition pilots from near and far. 32 pilots participated in 5 classes and enjoyed conditions ranging from tough to perfect. Every year, the Evergreen Soaring club goes on a weeklong encampment to the Ephrata Airport, located in central Washington. Ephrata usually has strong thermals and high cloudbases, giving club pilots a chance to soar for long periods and try cross country flights. Memorial Day saw the now traditional Dust Up fun contest at Ephrata which was also the begin of the Evergreen Soaring encampment this year. This provided the opportunity for novice and experienced pilots alike to enjoy the thermal conditions and the wide open spaces of Eastern Washington. Following are the observations and reflections of our youngest XC pilo, who is incidentally now also preparing for the Region 8 contest. For 12 years now the soaring flight evaluation program Onlinecontest or OLC has become the worldwide standard for evaluation of flight performance providing almost instant insight into what is happening in the world of XC soaring. It went thru a number of changes and updates but is now officially endorsed by the International Gliding Committee (IGC) and has been a tremendous instigator of getting pilots to push their XC soaring skills. I like Oregon. Always have. I was born there, and brought up on the south coast in the logging and fishing town of Coos Bay. Of course I can visit by car or any other conveyance, but since I like to fly gliders, visiting the home state in my favorite method of transport, the UN-motorized glider, has always been a goal.